Not really an occupational hazard, but close enough. 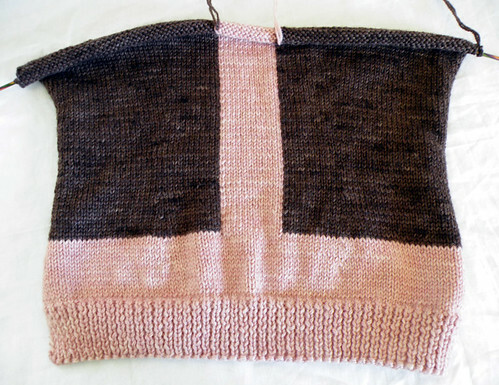 Knitting as much as I did during the Olympics was fun, but when it was over I needed a break. It’s not like I haven’t been knitting at all. 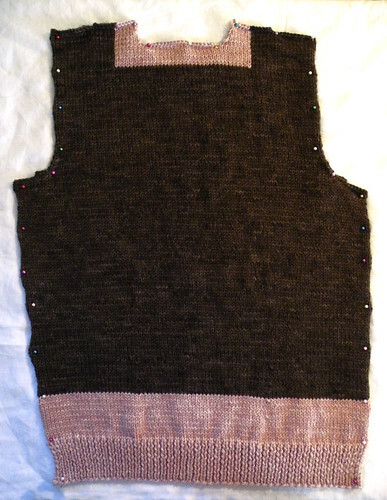 I finished up the back of Adelina, the pullover I’m test knitting for Amy of Stash, Knit, Repeat, and am over halfway done with the front. 1. No matter what happens with my husband’s job, we still have each other and that’s what matters. 2. I don’t have to go back to work until Tuesday, and I’m planning on doing a lot of knitting this weekend. 3. I’m going back to school, starting in June. I’ll be finishing up my BA in History, then it’s on to grad school and my MA in Library Science. Sounds like my girl is right on track; I am proud of you Honey! God takes care! He knows what are our capacities that we can go throught. That was a “pensée” for you, friend-knitter-by-the-web! Best of luck with school! I finished my MLS in 2006 and loved all of my classes. The sweater looks so very cozy! What does test knitting usually entail? Congrats on going back to school to get your BA and MA! I’m keeping my fingers crossed for you and your husband. So long as you’re both there for each other, with knitting in tow, everything is going to be A-OK. 😉 Trust me, I’ve been there.